Regina Regazzi, a 38-year-old New Yorker, is one of the lucky ones. Found to have type 1 diabetes as a child, she has remained relatively free of complications and continues to lead a healthy, active lifestyle. In fact, this executive recruiter has even run several marathons. "...With modern-day therapy, [a diabetic's] outlook is much brighter than it has ever been," says the lead researcher. She tests her blood sugar six times a day (sometimes more) and uses an insulin pump to administer the hormone all day long, which keeps her blood sugar as close to normal as possible. Now, research shows that this fairly new approach to controlling type 1 diabetes -- as opposed to the one or two daily insulin injections that had been advised for decades -- pays off. People who aim for -- and achieve -- such intensive glucose control are much less likely to lose their vision, have kidney failure, develop heart disease, or need an amputation than those who don't, according to a study published Monday in Archives of Internal Medicine. What's more, the research shows that people with type 1 diabetes, including Regazzi, fare much better nowadays than they did 25 years ago. In the new study, a research team led by David M. Nathan, M.D., of Massachusetts General Hospital, in Boston, looked at results from three large, long-term studies: the Diabetes Control and Complications Trial (DCCT); its follow-up study, the Epidemiology of Diabetes Interventions and Complications (EDIC); and the Pittsburgh Epidemiology of Diabetes Complications (EDC) study. In people who had diabetes for about 30 years, the rates of diabetes-related eye damage and kidney problems were much lower in those who practiced tight control, compared with their counterparts who had the disease before intensive therapy was common. In those who did not practice intensive control, the rates of eye, kidney, and heart problems were 50 percent, 25 percent, and 14 percent, respectively, compared with 21 percent, 9 percent, and 9 percent in those who practiced tight control. "This is great news," says Nathan. "Intensive therapy improves the long-term outlook for people with type 1 diabetes, and if they are able to achieve and maintain glucose levels that are as close to a normal person as possible, they have a much lower chance of suffering from the devastating complications that have historically affected people with diabetes. Overall, the outlook for people with type 1 diabetes is much better than it has ever been, according to Nathan. "Physicians and patients can now have a clear idea of what their prospects are over a long period of diabetes," he says. "They had a bad outlook -- a chance of developing amputation, kidney failure, and blindness. But with modern-day therapy, their outlook is much brighter than it has ever been." Modern therapy includes insulin pumps, such as the one Regazzi uses; a greater variety of insulin products, including man-made versions of the hormone; and better treatments for high blood pressure, high cholesterol, and other illness that tend to occur in people with diabetes. However, for some patients, intensive therapy may be easier said than done. "I see a lot of teenagers in my practice, and during the time when they transition into adulthood, there is not good control," he says. 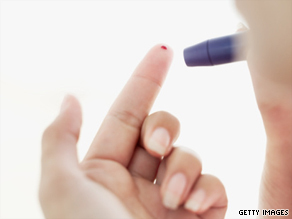 "But as you move into adulthood, a lot of type 1 diabetics do maintain excellent control.... Tight control is the best chance to limit the incidence of complications." Regazzi, for one, intends to stay the course. "Seeing people with some of the side effects, such as someone who develops a foot ulcer and then it turns into gangrene and leads to amputation, makes me stop and evaluate what I am doing," she says. "I would never want to become a burden on family or society because I couldn't control my diabetes." Regazzi sees a diabetes specialist as well as an eye doctor who's an expert in retinopathy. All study participants who received conventional treatment as part of the DCCT study were offered intensive therapy after this trial ended in 1993, and researchers followed up with them in the EDIC study. When the DCCT study began, conventional treatment for type 1 diabetes involved one or two insulin injections a day with daily urine or blood glucose testing. Intensive therapy includes keeping glucose levels as close to normal as possible by targeting hemoglobin A1C readings of 6 percent or less with at least three insulin injections a day (or an insulin pump). A1C readings provide a snapshot of average blood glucose levels over the past two to three months to give an idea of how well diabetes therapy is working.